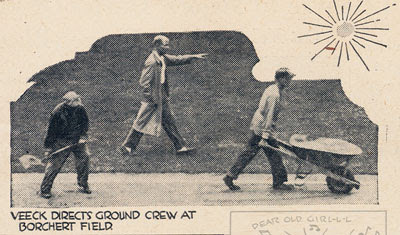 Borchert Field: "Veeck's Brewer Lure"
In August of 1943, the Sporting News ran a feature on Milwaukee Brewers president Bill Veeck, then wrapping up his second season in charge at Borchert Field. 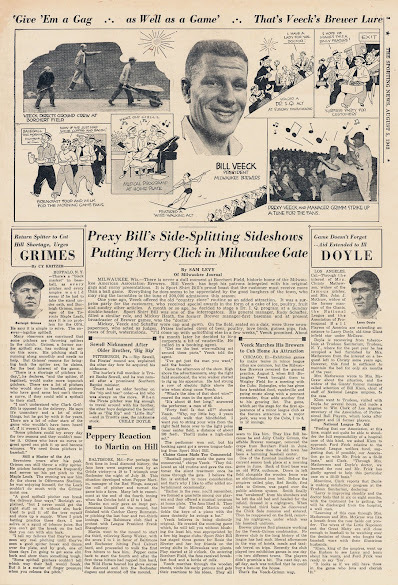 The article chronicles some of the innovations that made Veeck the "PT Barnum of Baseball" and the Brewers one of the hottest tickets around. MILWAUKEE, Wis.—There is never a dull moment at Borchert Field, historic home of the Milwaukee American Association Brewers. 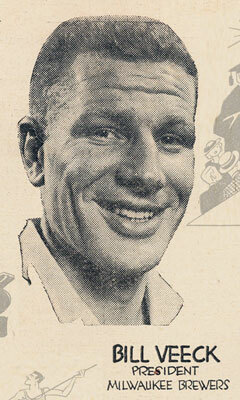 Bill Veeck has kept his patrons interested with his original gags and corny presentations. It is Sport Shirt Bill's proud boast that the customer must receive more than a ball game. Everything he does seems to be appreciated by the good burghers of the town, who may ring the turnstyles to the tune of 300,000 admissions this season. One year ago, Beeck offered the "old country store" routine as an added attraction. It was a surprise party for the customers, who received special awards in the form of a cake of ice, poultry, fruit and sundry other articles. 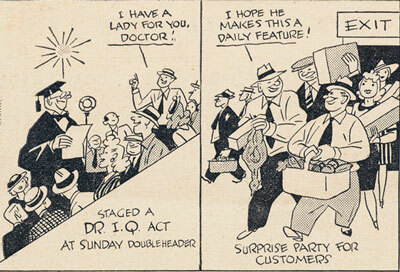 A month or so ago, he decided to stage a Dr. I.Q. 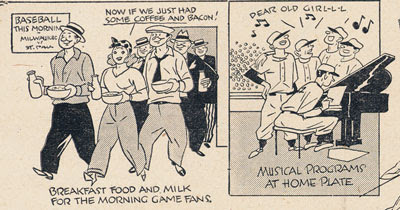 program at a Sunday double-header. Sport Shirt Bill was one of the interrogators. His general manager, Rudy Schaffer, filled a similar role, and Mickey Heath, the former Brewer manager-first baseman and at present broadcaster of Brewer games, was the "doctor." Mickey, Veeck and Schaffer wore cap and gown. On the field, seated on a dias, were three newspapermen, who acted as judges. Prizes included cases of beer, poultry, love birds, guinea pigs, fish, cases of fruit, watermelons. "I'll come up with something else in a few weeks," Veeck promised. About a month later he decided to incorporate a bit of vaudeville. He called in a booking agent. "Get me the best wire-walking act around these parts," Veeck told the agent. "I've got just the man you want," said the booker. Came the afternoon of the show. High above the advertisements, atop the right field scoreboard, the wire walker started to rig up his apparatus. He had strung a row of electric lights above the wire when along came Veeck. "What's the idea of that short wire?" roared the man in the sport shirt. "It's about 40 feet long," answered the performer, a man of 60. "Forty feet! Is that all?" shouted Veeck. "Why, my little boy, 3 years old, could walk that blindfolded. I want you to string your wire from the right field fence over to the light poles (near center field, a distance of about 500 feet). That'll make a high-class act." The performer won out, but his booking agent got a severe tongue-lashing from Sport Shirt Bill. 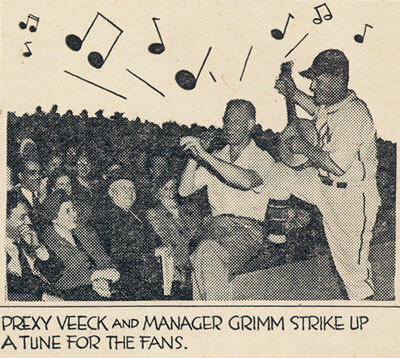 "Baseball people made the game too commercial," chirps Veeck. "They followed an old routine and gave the customer the silent treatment once he came through the gate. I believe the fan is entitled to more consideration and that's why I like to offer added entertainment occassionally. "Earlier in the year, you'll remember, we formed a quartette among our players and they offered a musical program at home plate. The fans liked it. They learned that Herschel Martin could tickle the keys of a piano with the same dexterity he swings a bat." Veeck believes in being distinctly original. He created the morning game which, he will tell you without blushing the least bit, was appropriated by a few big-league clubs. Sport Shirt Bill has staged three games for Rosie the Riveter and her boy friends on the swing shifts in Milwaukee war plants. Play started at 10 o'clock. On entering Borchert Field, the fans received breakfast food and a bottle of milk. Veeck marches through the wooden stands, visits his early patrons and gets their reactions to his ideas. They all seem to like him. 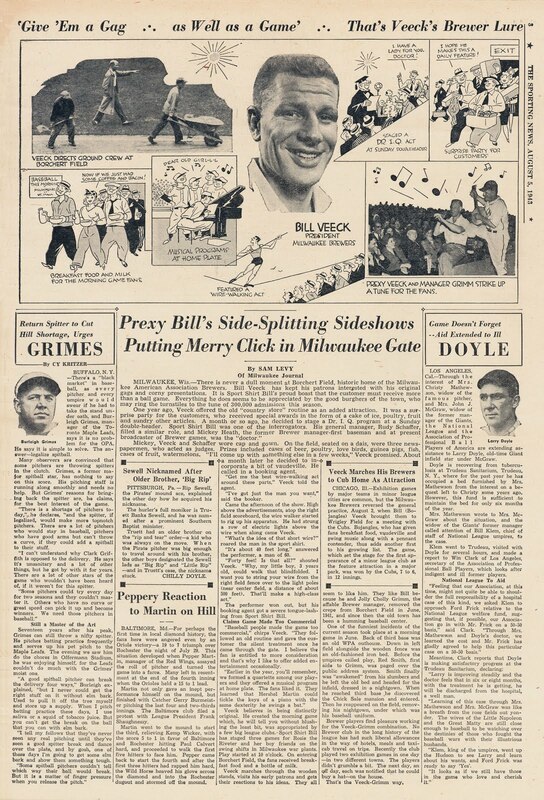 They like Bill because he and Jolly Cholly Grimm, the affable Brewer manager, removed the crepe from Borchert Field in June, 1941, and since then the old town has been a humming baseball center. One of the funniest incidents of the current season took place at a morning game in June. 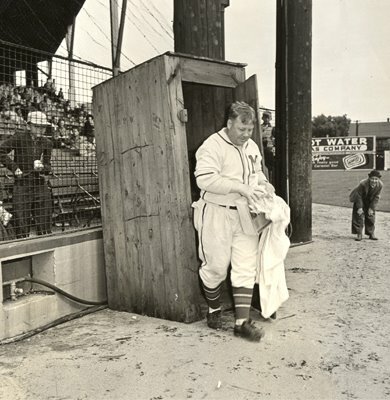 Back of third base was an old WPA outhouse. Down in left field alongside the wooden fence was an old-fashioned iron bed. Before the umpires called play Red Smith, first aide to Grimm, was paged over the public address system. Smith finally was "awakened" from his slumbers and he left the old bed and headed for the infield, dressed in a nightgown. When he reached third base he discovered the Chick Sale mansion and entered. Then he reappeared on the field, removing his nightgown, under which was his baseball uniform. Brewer players find pleasure working for the Veeck-Grimm combination. No Brewer club in the long history of the league has had such liberal allowances in the way of hotels, meals and taxicab travel on trips. Recently the club played two exhibition games in one day—in two different towns. The players didn't grumble a bit. The next day, an off day, each was notified that he could buy a hat—on the house. Fantastic, to see how Veeck's sideshow was viewed at the time.